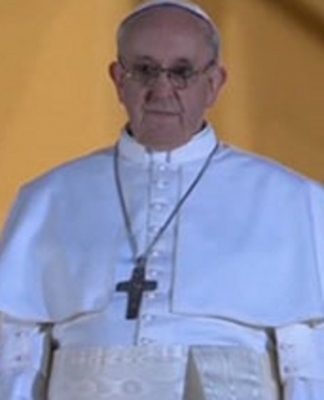 Our new Pope is Argentine Cardinal Jose Mario Bergoglio (pictured). The South American has taken the name Pope Francis I. He is the first pontiff from the America's and the first from outside Europe in a thousand years. As he was introduced to an adoring crowd in St. Peter's Square, he offered prayers for his predecessor Pope Benedict XVI. The Pope then blessed the crowd and all men and women of goodwill. Philadelphia Archbishop Charles Chaput is calling the selection of Pope Francis I a "wonderful choice" and a priest of "extraordinary intellectual and cultural strengths." Chaput still keeps a gift he received from the new Pope at their first meeting in 1997. The new Pope is a conservative Jesuit from Argentina. He was Jose Mario Bergoglio. Now he is Pope Francis I.
Argentine Cardinal Jose Mario Bergoglio was selected to lead the world’s 1.5 billion Catholics as our new Pope. For his papacy Bergoglio was announced as Francisco. He has taken the name Pope Francis the First. As the Archbishop of Buenos Aires he is a Jesuit intellectual who travels by bus and is an advocate for those suffering through poverty. Partly cloudy tonight. 30 in Center City.